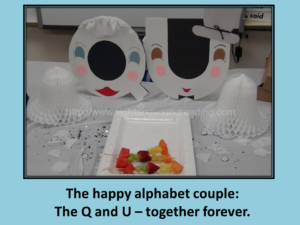 A few weeks ago, at the end of my kindergartner’s school year, my daughter’s class celebrated the marriage of the letters Q and U. 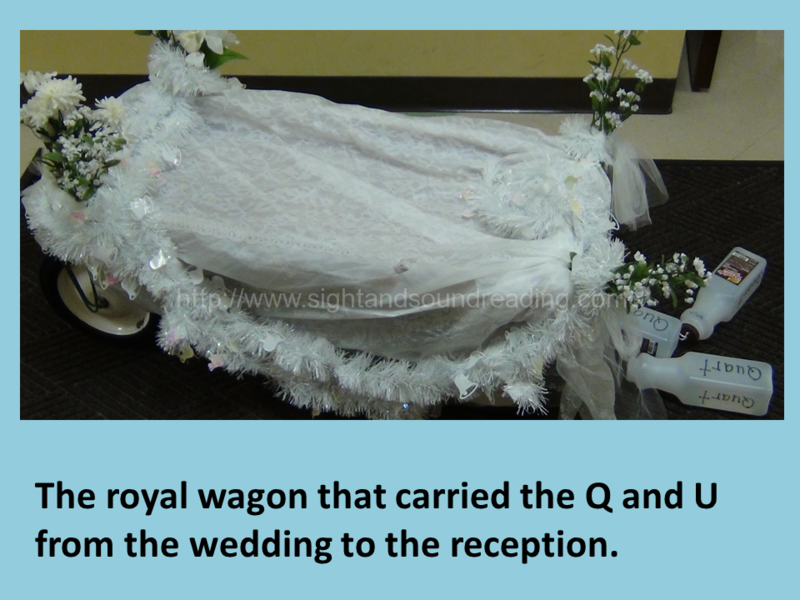 Her class read a book called The Wedding of Q and U . The book explains (in an adorable way), how the letter q is always joined with the letter u. The two letters marry each other in an elaborate wedding so that the q and the u can live happily ever after and always appear together in words like quarterback, quack and queen. The letter q has to understand that the u can go out on his own and appear in words like umbrella and underwear, but that he is committed to her and will always be with her to make the “qu” sound. Her class threw a bridal shower for the q during the week -complete with gifts brought in from home. All the gifts had to begin with the letter q. My daughter decided to ring in a Sight and Sound Reading alphabet worksheet with a quail on it. Other members of her class brought in quilts, queens (from a deck of cards) and quarters, to name a few. The day of the wedding is a big deal! The entire school gets to attend the wedding in the gym. Parents and friends are also invited to attend as well. At the end of the day the girls change out of their uniforms and into dresses to be the bridesmaids for the q. The girls all looked like queens! The boys get to wear football jerseys and helmets and be quarterbacks escorting their queens. 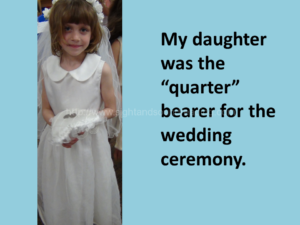 My daughter was the ring bearer, or, shall I say the quarter-bearer. She brought in the quarters ahead of all the bridesmaids. The Q is given away by her father, a comical quarterback played by the school’s custodian. 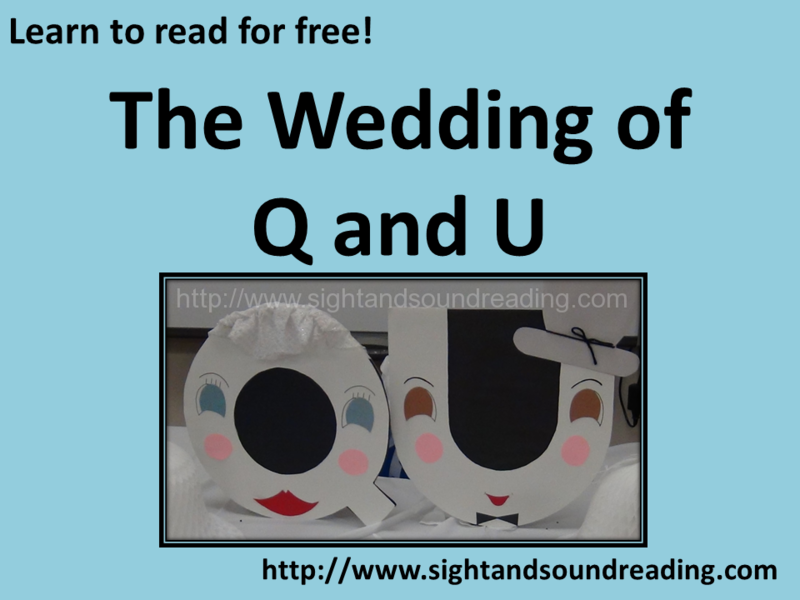 The letters q and u were wed by our priest, complete with a kiss! The q and u wedding is a memorable, fun, adorable way to teach students about how the q and the u always appear together. I know my daughter will always remember this fun event from her kindergarten class. 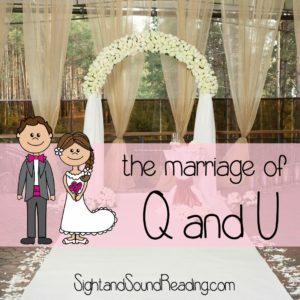 If you want to have your own Q and U wedding, I created some materials to help make it very easy to host your own wedding! Forget the months of planning for a wedding, Q and U can get married quickly, easily and affordably! This is the cutest thing I ever heard of! Just adorable! That is really cute! I don’t know how much I like that U can go and go wherever he wants, but he’ll come back to her :), however,kindergartners don’t think that deeply. I think they’ll always remember that q and u are together! LOL! I thought the same thing about the U being able to go off on his own… It is such a super cute idea, though – I decided it was okay. 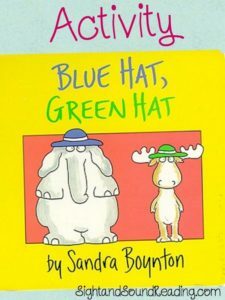 Glad the kindergartners don’t seem to think too deeply about it! This is too cute! 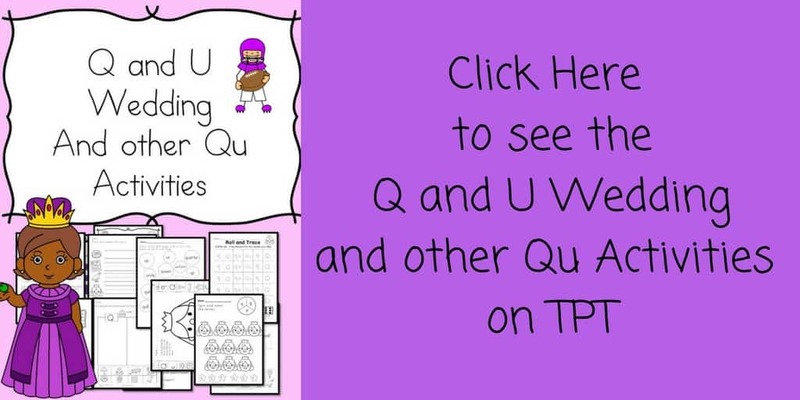 I love this idea for q&u! What an adorable idea and so much fun!